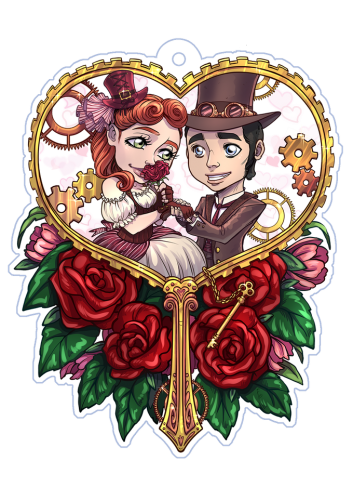 The modern day Holmes and Watson are man and woman (or at least one version of them is)… but why not have that dynamic against the backdrop of a Steampunk world? And instead of the will they/won’t they – let’s just have them say I Do before the story even begins! A love story, a murder mystery, and the happy couple who is at the center of it all. Kickstarter Campaign ends on Saturday, March 3, 2018 at 12:59 AM EST. Lord and Lady Ravenscroft are two brilliant scientists and inventors whose Bohemian lifestyle and inventive ways are in direct contrast to the staid and proper ways of Victorian Era London. 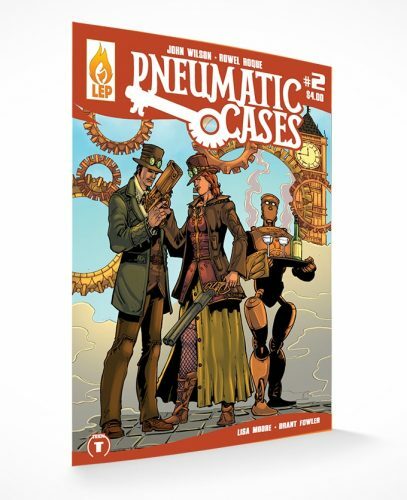 Served faithfully by their steam-driven metallic Majordomo, Pneuman, and armed with a variety of elaborate self-created inventions, the Ravenscrofts pursue the one vocation that brings excitement into their world… solving murders! Brought in to consult on a mysterious murder, the Ravenscrofts began hunting down clues that might lead them to the devious culprit. Making waves and alerting the wrong people to their efforts nearly cost them their lives. Now, the case takes them to Austria to seek out the next piece to this chaotic puzzle of murder and mayhem they’ve found themselves wrapped up in. I think I must have missed the first issue of this comic at some point, because I recognize the title, but obviously have not read it. Lucky for me, there are options to go ahead and catch up on the series. Regardless, this takes its nod from the mystery style stories of the time with a married couple at the center of it. I dig the idea of both of them being inventors as that way they both will have a chance to show off as the story progresses. The sample pages/ opening to the story makes this feel like it might almost be a stand alone adventure for the two of them, and makes me very curious about whether the first issue was done in the same fashion. 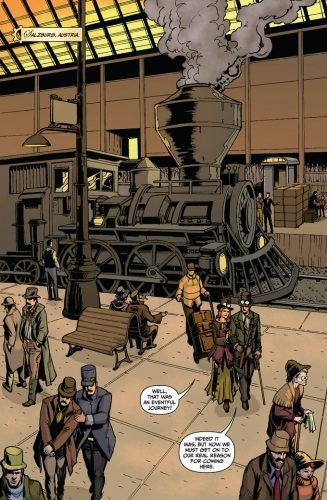 Given that my own Gilded Age comic is told in “done in ones”, it is a format that is near and dear to my heart. As part of Kickstarter’s “Make 100 campaign”, it’s a interesting idea to piggyback the Acrylic Charm ($39 level) with the comic campaign itself. I’ve seen many people do the small pin designs throughout the month, but couldn’t figure out a way to tie it into a potential comic campaign. Leave it to the Last Ember Press guys and gals to figure that piece out. In addition, at the $17 level they have basically a preorder for issues #3 and #4 as well which again is not only thinking towards the future, but really making it so that this project will get to its issue 3 and 4. At the highest level ($250) you can get Drawn In to issue #3… always a cool option. If you’re reading this blog, I’m guessing that you have at least a passing interest in all things Steampunk. This is definitely that… so what are you waiting for? Go to the Kickstarter page here! To find out more about Last Ember Press and their other comics, check them out here.